The high priest Ananias came down with some elders (Acts 24:1). It is thought that Ananias ben Nedebeus officiated as high priest in Jerusalem from about AD 47 to 59, although there is not consensus on these dates. The events recorded in this verse took place in about AD 57. He was one of the very last high priests, since the Jewish people have not had a functioning priesthood since the destruction of Jerusalem in AD 70. 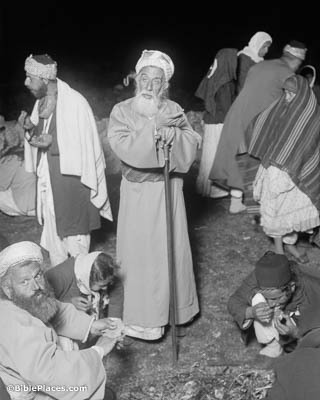 The Samaritan high priest shown here, photographed between 1900 and 1920, is perhaps the nearest recent parallel. We find this man to be a menace and one who stirs up riots (Acts 24:5). The Roman wariness toward riotous activity is a recurring theme in Acts; they clearly did not want another insurrection on their hands like the earlier Maccabean Revolt. The fear was not unfounded, as it would not be many years after the events recorded in Acts that the First Jewish Revolt would begin, ending in the destruction of Jerusalem and the temple in AD 70. The Second Jewish Revolt, also known as the Bar Kokhba Revolt, began in about AD 132. 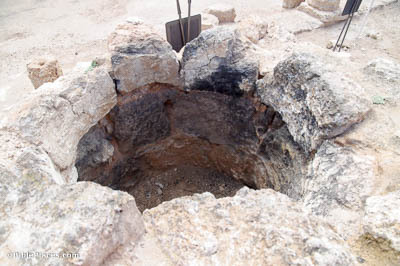 This makeshift weapons foundry at Herodium dates to that latter conflict. I came to bring alms to my nation (Acts 24:17). The alms mentioned here refer to the collection that Paul had gathered from the churches of the Diaspora for the saints in Jerusalem. 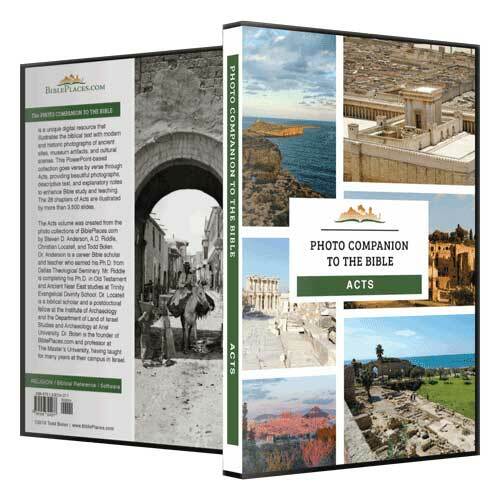 He seems to have begun this collection at the most distant stop on his third missionary journey, Corinth, before making his way back to Jerusalem (see Acts 20:2–3). 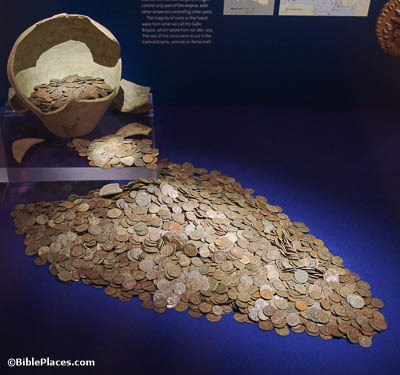 Pictured here is a hefty hoard of some 5,000 bronze coins from the 3rd century AD. He gave orders to the centurion that he should be guarded (Acts 24:23). 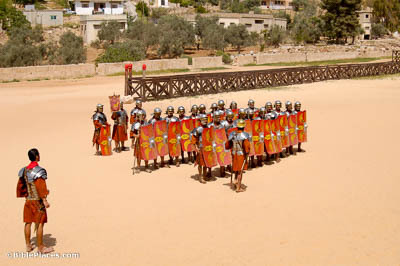 The typical legion in the 1st century AD was made up of ten cohorts; the first cohort was double, made up of five centuries of about 160 men each. The other nine cohorts each had six centuries made up of about 80 men each. A centurion would thus be in charge of between 80 and 160 men, depending on which cohort he was in. Not all of them would be assigned to protect a prisoner like Paul, of course, as he was not accused of any violent crime. Yet he should have some freedom, and not prevent his friends from serving him (Acts 24:23). In addition to providing Paul with fellowship, contact with his friends likely allowed Paul access to things like clothes, writing equipment and books, and better food than what he otherwise would have had. This fresco was created by Filippino Lippi around 1482. 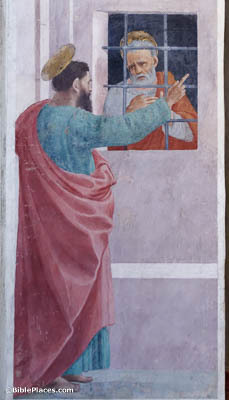 It shows Paul visiting Peter in prison, but here is used to illustrate a friend visiting another who is incarcerated.